It looks like the Ravens are back in championship form after starting the season tentatively, their last week blowout of Westshore who in turn blew out JBAA this week shows the relative playing strengths right now. They defeated the current University champions and finalists of last year and now sit a comfortable 4th in the standings. It's looking like a CW, UBC, Burnaby, Ravens final four with UVic as the dark horse. There's still another half a season to play starting January 12th. CW end the fall break with 34 points, Burnaby and UBC at 33, Ravens at 26, UVic at 23. 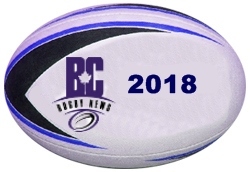 A replay of last year's BC Premier championship game, won by the Ravens. UBC just coming off their defence of the University title last weekend but they weren't as dominant as the previous year. UBC won the previous encounter against the Ravens in October by +20. Ravens coming off a good performance against Westshore may be returning to last year's championship form, this match will be a good indicator of that. Sean Ferguson back in the roster for the Ravens and along with McLelland and Sandover-Best offer some good attacking options. It should be interesting, if Ravens keep it within 3 or win the match then I think they have a shot at making the final this year. Currently it's looking like a CW, UBC, Burnaby race with Ravens, Seattle or UVic as possible additions to the semi-final four. Prediction: UBC by 3. An improvement for Nanaimo who lost -57 last time vs the Vikes at home, -18 on the road and it looks like they picked up a bonus point. Nanaimo have had a couple of blowout losses this season but currently sit in 9th spot ahead of 3 other clubs with 2 wins and a draw. The Vikes jump up to 5th place with the win and sit poised to make a run for a top 4 spot if any team falters. The top 6 make the playoffs so Vikes are well placed to be playoff bound come April. VICTORIA- The University of Victoria Vikes men's rugby team finished off the first half of their season in fine fashion by defeating the Nanaimo Hornets by a score of 50-32 at Wallace Field in Victoria on Dec. 1. "They are a good side, you can see why they have started to pick up some wins lately," commented Vikes head coach Doug Tate. "They were physical with us today and were complimented by some hard runners throughout their line up. I wouldn't be surprised if they made some noise and began to climb up the standings in the second half." In the eighth minute, the ball was swung out wide to flanker Ollie Nott and a pop pass back to his inside sent Vataiki in for his second try of the game, increasing Victoria's lead to 12-3. Brennig Prevost further improved the Vikes lead in the 11thminute after busting through the Hornet defensive line and scampering 65-metres down field for the try. Nanaimo scored back-to-back tries in the 17thand 22ndminute of the game to cut the Vikes lead. The Hornets pulled to within four points but Logan Martin-Feek and James O'Neill each touched down a try before the first half was over to give the home side a 31-20 lead at half time. Nanaimo coming off the upset over Capilano will be feeling confident, UVic after a disappointing University championship, where they failed to make the final, will be looking to make a statement. In Nanaimo's last match their two star backs Jared Stephens and Cathal Long accounted for 4 of the 5 tries. UVic have a lot of talent throughout the roster especially in the backline, in the first match between these sides it was UVic by +57. It will be closer this time around but UVic should pull away in the final 20 minutes. Prediction: UVic by 10. An 8 try performance for Westshore with only 1 conversion. Quinn Ngawati scored 3 tries from his blindside flanker position. As we've said before he's a loose forward at heart, eventually a national level #8 but at 19 years old he's still growing. His aggression and ferocity at this young age bodes well for his future, he's already taller than the second rows out on the field. We look forward to seeing him in 7s action with the national team in the near future. It was a close match to begin with as teams traded tries back and forth but Westshore finished stronger. The Bays had national team winger Kainoa Lloyd and prop Noah Barker but they couldn't influence the decision in the Bays favour. Westshore sit in 10th place, the Bays in 11th in BC Premier standings. This match doesn't count towards the Premier standings but towards the Barnard Cup which is an Island Premier team competition. It results in Island teams generally having more matches than Mainland teams during the season. The Bays have Noah Barker back from the repechage, he didn't get to play any games so will be itching to get some game time in. Newcomer Cooper Coats played well last match from fullback, he's moved to inside centre for this match. Westshore have moved young Rugby League and carded 7s player Quinn Ngawati from centre to loose forward a move we'll be interested in following. Westshore also have the U20 duo Seth Purdey and Kevin Vertkas suiting up. Bays will have the edge in the front row with Barker's return and Ryan Kotlewski not listed for Westshore. Westshore might have the edge in the loose forwards with Mosychuk. It should be an interesting match and we'll give a slight edge for the home field advantage. Prediction: Westshore by 2.